"For a dog trapped in a hot car, every minute, every second counts." 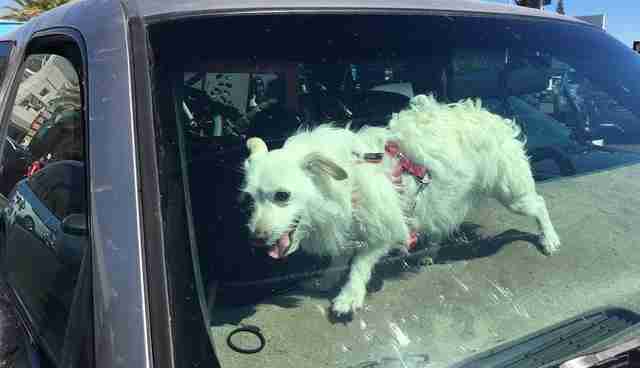 A new California law now lets people smash a window to save animals trapped in parked cars. The law, signed over the weekend by governor Jerry Brown, protects people from criminal charges, as long as all other means of saving the animal have been exhausted. And, the person breaking the window must stay with the car until police arrive. "For a dog trapped in a hot car, every minute, every second counts," Lora Dunn, senior staff attorney at the Animal Legal Defense Fund (ALDF), tells The Dodo. "This legislation is so important because it empowers citizens to ... rescue these animals from these precarious situations." The rule comes on the heels of a spate of heat-related incidents involving animals left in parked cars this summer. In June, for example, firefighters in Sacramento, California, smashed their way into a car at a shopping mall - just in time to save a dog's life. At the time, the weather was a searing 91 degrees. But inside the car, it was even worse. "It was 160 degrees in the car," Chris Harvey, one of the firefighters who responded to the call, told The Dodo in June. "We checked it with our thermal imaging camera." Of course, California isn't the only state where people leave their pets in cars. Recently, The Dodo has covered cases from New York City - where a woman left her dog to swelter while she got her hair done - to a baseball game in Kansas City, Missouri, and a concert in Ontario, Canada. California is among a handful of jurisdictions leading the legislative pack to give pets the protection they need. Other states like Florida, Tennessee and Wisconsin have variations on the same legislation essentially protecting people who damage property to save a life. "There is a growing trend toward passing these so-called Good Samaritan laws involving animals in hot car situations," Dunn says. New York also has a bill pending, as does Pennsylvania. But all of the laws have one important thing in common. "We are happy to see all of these laws require citizens to first call 911 or contact law enforcement before taking matters into their own hands," Dunn says. "That's for the safety of citizens as well as animals inside the vehicles." It's important to remember that outside temperatures are rarely the same as those inside parked cars. An outside temperature of 80 degrees, for example, can surge to around 100 degrees inside cars. Want to know what you can do, legally, in your state, to help a dog left in a hot car? Click here.